Thanks Mayor Pro Tem Linda Campbell and Commissioner Betty O’Neal for Volunteering your time to the Town of Norwood ! The Town of Norwood would like to express our most sincere appreciation to Mayor Pro-Tem Linda Campbell and Commissioner Betty O’Neal for their many hours of unpaid service to the Town of Norwood. Both ladies have been instrumental in providing leadership to the Town of Norwood and have contributed much to the visioning process as Norwood works to position and re-brand it’s identity as a community with Pride and Forward Progress. “Working well with with the current board of Commissioners has been the secret ingredient”, says Campbell. “It takes a lot of effort to make a positive difference and change the direction of a town”. Both have been very active in the community and have helped brand Norwood as a town of the move. 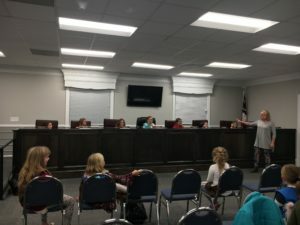 Last week, Mayor Pro Tem Campbell invited local Girl Scout Troop 1540 to Town Hall to go through mock scenarios to see how they would handle the various situations. After explaining the process of government and all the various roles, the young scouts took their places in the council chambers and began to determine whether or not to allow candy to be thrown out at the Christmas Parade and when to turn on the Christmas lights. They voted to not allow candy to be thrown out at the Christmas Parade and to not wait until the Christmas Parade to turn the lights on. Just turn them on once they are up and plugged in. Commissioner O’Neal was very involved in Small Business Support and liaison to the Norwood Business Association. Commissioner O’Neal was very instrumental in helping connect our local businesses with resources and was always eager to offer her assistance. Commissioner O’Neal always reviewed details of the business that came before the council, researched the issues in depth, and contributed much to the discussions. Her insight provided a much needed viewpoint on the board and helped create the current forward momentum underway in Norwood. The Town of Norwood would like to wish both of these leaders the very best as they now have the opportunity to relax just a little more a few Mondays each month.